Just the way nature intended it to be! Our six farms, which equal almost 3.9 square kilometers, have been certified organic by Ecocert for over two decades. Our main product is certified organic Buckwheat for the gluten free market, and we have bees to pollinate the Buckwheat. But I must be honest with visitors and customers...I do not certify the honey as organic. The bees have lots of wild plants, wild fruit trees, clovers, vetches, raspberries and other plants here early in the summer. The bees pollinate the organic Buckwheat in late July and August. Our organic certifier demands that we can absolutely, guarantee no cross contamination from our farms. Despite providing lots of plants for the bees to collect nectar from our organic farms, I cannot provide a paper trail to prove the bees do not fly off our farms. Bees are wonderful, interesting little creatures, but sometimes they just like to fly off for a different change of scenery some days. "consumers at the Royal Winter Fair often remark that they want to find fresh food right from the farm source, with no preservatives. Here is that rare opportunity to meet and talk to the producer. "We produce "RAW HONEY". We also mill, and package gluten free buckwheat flour. 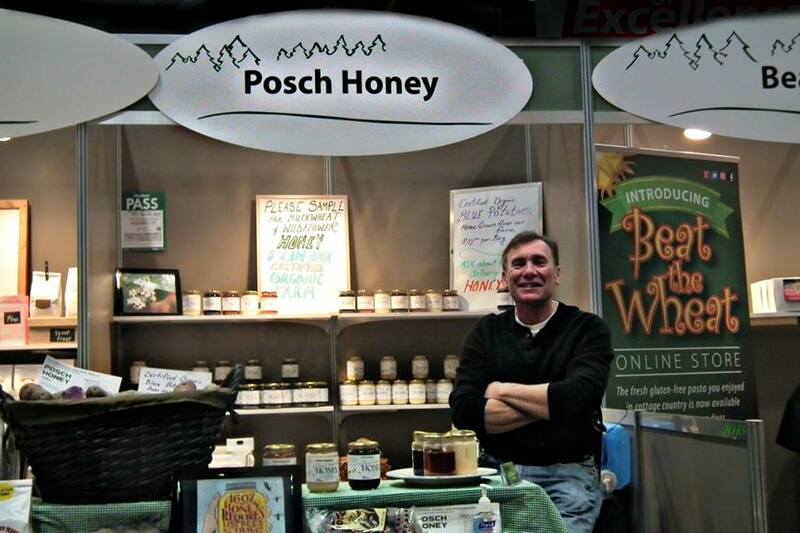 ​At the Royal Winter Fair in 2016, we had a draw for an order of eleven jars of honey delivered, to promote this web site. The winner was Rebecca Grese of Oxford Mills, Ontario. In 2017, we did another draw for eleven jars of honey. The winner was Don Ward of Bloomfield Ontario. Congratulations! ​The package will be mailed right to the customer's Canada Post mailing address. ​Thanks to the thousands of people who took a few minutes to enter the draw.